At the Nativity, we celebrated Jesus’ birth in flesh and blood. Today, we celebrate a second “birth” in the Spirit—our own. We know from the Gospel accounts that John the Baptist raised many Messianic expectations when he preached a baptism of repentance at the Jordan River. Because of an Old Testament prophecy in the Book of Daniel, in which the angel Gabriel revealed a kind of “timetable” for the coming of the Messiah (see Dan 9), the people in Jesus’ day, knowing that the prophecy’s date had come due, were on high alert. John’s charismatic presence and his clear prophetic vocation aroused suspicion that he might be the Lord’s “Anointed.” John corrected them: “One mightier than I is coming after me; I am not worthy to stoop and loosen the thongs of His sandals. 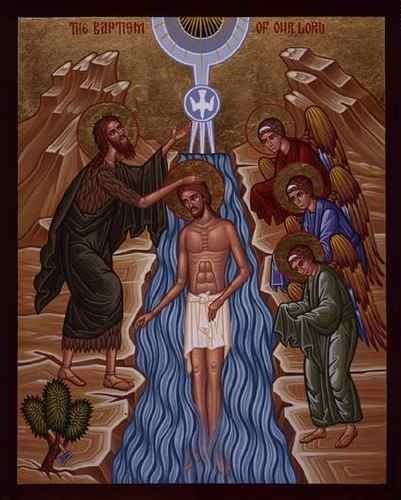 I have baptized you with water; He will baptize you with the Holy Spirit.” Why was John baptizing “with water”? It was a long-standing element in Jewish purification rituals, for obvious reasons. Water cleanses and purifies; it also sustains life. Going all the way back to the Flood, the Jews knew that water figured prominently in salvation history. 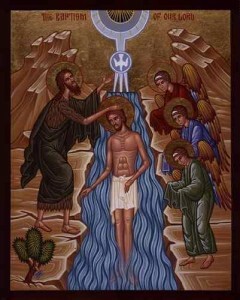 By John’s day, going down into water and rising up out of it represented a sinner’s desire to turn from sin, be cleansed from its effects, and start fresh. When Jesus appeared one day at the Jordan, why then did He take His place in line and submit to John’s baptism? Why would God’s Son need to participate in a ritual like this? Even the Baptist balked at this idea: “John tried to prevent Him” (see Mt 3:14). In a most dramatic way, Jesus demonstrated that He did not come only to be human like us. That was accomplished in the Incarnation. No, He became flesh and blood so that He could step into the place of sinners and accomplish what John’s baptism only symbolized. Water, all of its own, can’t wash away the ocean of human sin! That could only happen with the death of sin itself, represented in baptism by the penitent’s disappearance under the surface of the water. Sin’s consequences mean death; man’s rebellion against his Creator requires a just punishment. When that requirement is satisfied, the penitent is free. Jesus got baptized as His first public act of identification with man’s sin and His first step to defeat it, releasing all those held captive by it. That, of course, would require Him to be submerged into death, into the grave, into the netherworld—the Cross. His victory over those would be accomplished by His Resurrection; here it is symbolized by the opening of heaven and the descent of the Holy Spirit. In the old order, death meant the end, a dissolution. In the new order Jesus established, death in the water of baptism means new life, a re-birth, a truly new and eternal start. God spoke on the day of Jesus’ baptism: “You are My beloved Son, with You I am well-pleased.” All those re-born in the waters of baptism Jesus has given to His Church receive this same expression of love and delight from our Father. Jesus makes it possible for all of us to be born again into the relationship God originally intended for man and woman, blurred and distorted now by sin. His baptism is not only with water but with “the Holy Spirit and fire” (see Mt 3:11). It wipes away sin and implants divine life in us. John the Baptist knew his baptism could not accomplish that! In humility, he acknowledges this: “I need to be baptized by You, and yet You are coming to me?” (Mt 3:14) Still, God allowed him to participate in the first public act of the Messiah for Whom he worked so tirelessly to prepare. What a blessed day that must have been for him. God, through the prophet, Isaiah, foretold that someday His “servant … My chosen one with Whom I am well-pleased” would appear within human history. The description of this Servant was fulfilled most wonderfully in Jesus, Who began His public ministry on the day of his Baptism. He was tender and caring with those on the fringes of Jewish society (the bruised reeds and the smoldering wicks), whether because of illness, poverty, or sin. He worked to be a light to the blind of all nations, not just the Jews. It was a quiet work, often done in out-of-the-way places, in homes, on the side of a hill, or from a boat. It was most fitting that on the day of His Baptism, God used the words of this prophecy (“My chosen One with Whom I am well-pleased”) to confirm that Jesus was the long-expected Messiah, Who would “bring forth justice to the nations.” He came to set the prisoners free. The psalmist calls us to “give the Lord glory and praise.” When we think about the work Jesus came to do for us, beginning with His Baptism, that’s exactly what we want to do! We know that because Jesus was willing to die for sinners, “The Lord will bless His people with peace.” See how the psalmist says, “The voice of the Lord is over the waters.” We know that at Creation, the Spirit of God hovered over the face of the waters as God spoke the earth and its inhabitants into being (see Gen 1:2). Our Gospel tells us that God spoke over the waters of Jesus’ Baptism; once again the Spirit moved “over the water,” this time to bring forth new life for man through Jesus, to be administered through our own baptism. This should move us to sing with the psalmist, “Give to the Lord the glory due His Name. Possible response: Heavenly Father, please help me to live as a child with whom You are “well-pleased,” trusting Your Son and accepting His gift of salvation. This entry was posted in Bible Studies, Sunday Lectionary Readings. Bookmark the permalink.